Therapetics Service Dogs of Oklahoma, Inc., formed in 1992 in Mounds, OK by Susan Phariss, was the first organization in Oklahoma to train service dogs for people with physical disabilities. Since then, Therapetics has trained more than 40 service and companion/social dogs for people in the greater Tulsa area and throughout the state of Oklahoma. While Therapetics got it's start in the small town of Mounds, OK, we moved our facilities to Tulsa in August of 2004 where our tradition of excellence continues. 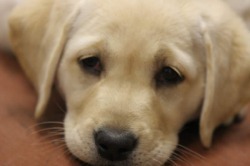 In fact, Therapetics was awarded full accreditation by Assistance Dogs International in 2007. The mission of Therapetics is to enrich the lives of Oklahomans with physical disabilities, one dog at a time.